Over 140,000* investors are already benefiting from Direct Lending as a new way to generate steady returns. What could it mean for your clients? Goji’s products have been designed with advisers in mind and are available within a number of tax-efficient wrappers, including the Innovative Finance ISA. Helps finance critical sectors of the economy such as property, education, SMEs and renewables. An opportunity to earn returns that are higher than cash, less volatile than traditional fixed income and uncorrelated to mainstream investments like shares. An opportunity to earn a steady return whilst having a positive impact on society. Use the slider below to change the investment value. You can also toggle between 3 and 5 year options. Goji have rules in place to ensure we act in investors’ best interests to mitigate and manage risk. Read the details here. 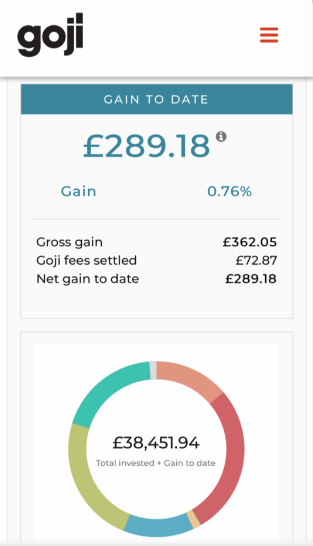 Goji’s proprietary wealth management platform is simple to use and helps you create investments on your clients’ behalf. You can track performance and your clients can log in and use the straightforward interface too. We understand that Direct Lending is a relatively new asset class, but it’s one we believe presents new opportunities for Advisers and their clients. We’re committed to educating around the sector and would be happy to speak to you in more detail.